This House has been the surprise package of what is proving to be a very successful season for the National – defying the surrounding economic gloom with a string of sell-out hits. It was inevitable that tickets for The Effect, Lucy Prebble’s follow-up to ENRON, and the latest Alan Bennett play would be scarcer than gold dust. However This House did appear to be an altogether tougher sell; a play based almost entirely back rooms of Parliament, set between 1974 and 1979 and refusing the safety-net of caricature by eschewing references to MPs by name. Unless one held an acute knowledge of mid-70’s parliamentary constituencies it paid little concession to providing a Spitting Image-style satire on its subjects other than references to a certain ‘MP for Finchley’ and a fleeting appearance from a young Michael Heseltine. As a self-confessed political and theatrical nerd none of this was particularly troubling as seeing the political process dissected on stage was the real joy. The likes of David Hare may stage politics with a big ‘P’, and there have always been any number of young tyros looking to reflect the impact of politics on society, but the institutions – the strange and archaic mechanisms that have supported one of the world’s longest running parliamentary democracies seem to have been rarely considered by playwrights. Lord Scarman summed up the position eloquently in the late 80’s when he referred to the fact that the people are ‘only occasional partners in the constitutional minuet danced for most of the time by Parliament and the political party in power’. For all the radicalism of playwrights and protestors, politicians continue serenely onwards, safe in the institutions that have bent, flexed and twisted but never entirely shattered over the centuries. The British parliamentary system finds durability in its seeming lack of permanence. The lack of a codified constitution allows great flexibility in its approach; rules are in place because they are in place and always have been in place, not because they are written down in a book. The very essence of maintaining the status quo, a great British tradition, is built into this approach. Without an awareness of the rules, and without any access to them, how can someone challenge the system? It is into these murky waters that James Graham’s This House looks to shine a light. It illuminates the hidden world of small ‘p’ politics; the grindingly mundane processes that allow the Government to govern and teases out exactly what happens when the metaphorical rulebook is thrown out of the metaphorical window. So much of Parliament – the opening of Parliament by Black Rod, the Queen’s Speech, Prime Minister’s Question Time – is laced with symbolism about the importance of the function it serves, even if these aspects mean nothing to actual governing. James Graham and Jeremy Herrin have intrinsically grasped the parallels with theatre, which is that behind the spectacle there are those working themselves to the bone to keep the wheels turning and where power really resides. This is why the play focuses on the political Whips; the backroom boys who ensure that everything happens on time, that people know what they are supposed to be doing and that things actually happen. The production veers sharply between two very different halves. Before the interval we see politics as a pantomime – with its clearly delineated heroes and villains, with vaudevillian gags and slapstick characters providing an element of farce. It is all very funny but by the break the audience is left in a state of perplexed enjoyment, as there is little suggestion of what the play is about. The second half is a very different animal, whilst never losing sight of its humour Graham manages to find the emotional core of the play. The ‘backs-to-wall’ absurdity of the first Labour Government in 1974 has been replaced by the grim, gruelling political reality of staying in power. Faced with a resurgent opposition under a certain Mrs T, a truculent back-bench peeling to the far-left and a front bench that sees a defection across the floor, there is little space for jokes; particularly as a succession of by-elections sees the Government’s majority whittled away until they are back at square one and the deal making must begin in earnest. The whole play feels like a truthful depiction of politics in action. The initial euphoria of victory is seen in the inevitable grand claims and bold speeches, a real sense of being able to change the world, and which is slowly replaced by the wearying toil of back-biting, deal-making and underhand tactics from which humour is notable by its absence. The play itself seems to be very interested in the concept of mirrors and doubles. The idea of a single whole split into two halves recurs over and over; it is reflected in the two-party system, where minor parties are only there to be courted for votes, it is seen in the idea of pairing that drives much of the narrative thrust of the play and Herrin’s staging reinforces the idea of the two parties being mirror-images of each other. The whips each have their doubles and form two sides of the same coin. 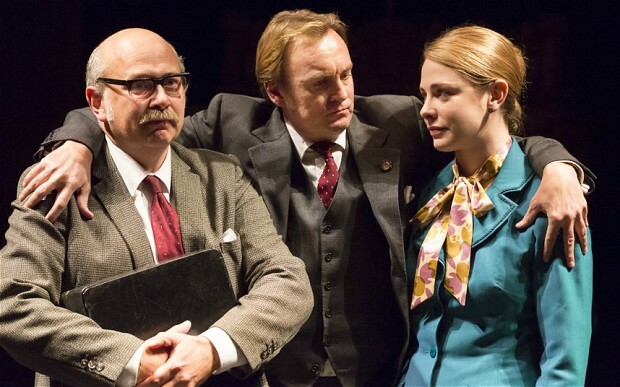 This provides the most intellectually interesting element of the play and Graham excels in bringing to life the notion that under the surface politicians often have more in common with each other than the wider electorate. The gentlemanly concept of pairing seems incomprehensible to the outside but once it is broken it is clear how hard it is for Parliament to operate without it. The whips office may constantly undermine each other but still have more in common than with the MPs who view them with such suspicion. Not everything about the play works – at 2¾ hours it is certainly too long. The first half could be trimmed by 20min with little loss, and the decision to stage much of it in the same two sets creates a rather static play and, given the length, you do begin to feel that you are seeing the same scenes on repeat. This may reflect politics depressingly accurately but perhaps a little more consideration could have been given to the theatre at this juncture. Whilst the dialogue between the Whips crackles throughout, there were attempts to explain various elements of the parliamentary process that never quite gelled with the rest of the script, and ended-up as rather laboured exposition. It may be the case that most people are not aware of the Chiltern Hundreds or the fact that no-one dies on the floor of the House but the way it was incorporated didn’t really work and felt rather like someone reading out a Wikipedia article. It was, on balance, a good decision to not overtly reference politicians; indeed the merest sight of Heseltine was enough to realise why it was better without them. 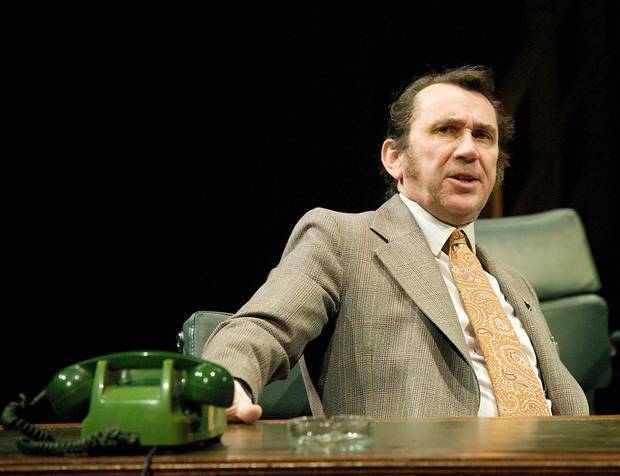 The politics of this period, and certainly the decade that followed, remains too politically charged to have avoided destabilising the fact that this was a play about small ‘p’ politics. If you feature politicians, you cannot avoid Thatcher – and as soon as you include Thatcher, it has to be a very skilful play for it not to be about Thatcher. This House is interested in how things work rather than how things ought to work, and so by turning people into constituencies it was possible to avoid the risk of caricature. This House is a curious play but a decent one. Having seen it, the reason why it is such a hit remains something of a mystery. Maybe the country is fuller of nerdy political types than electoral turn-outs would suggest, or perhaps it has stuck a chord with an electorate, who for the first time in a generation, are seeing similar deal-making played out in front of them. Either way for a play with little dramatic arc and where we know where it will end, it is remarkable that the journey should prove to be so interesting.